FERNANDO DE NORONHA, Brazil (CNN) -- Forty-one bodies have been recovered from the crash of Air France Flight 447, the Brazilian Navy Command and Aeronautical Command said Tuesday. 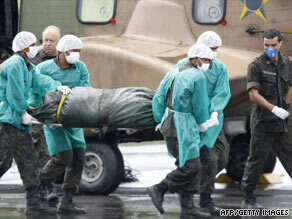 Brazilian military personnel on Tuesday carry the remains of one of the passengers of the Air France crash. Sixteen bodies pulled from the Atlantic Ocean Tuesday were taken to Fernando de Noronha for transportation Wednesday afternoon by helicopter to the air base in Recife, Brazil. The 25 bodies previously found were put aboard a Brazilian frigate. Searches for the remaining bodies will continue overnight, the navy and aeronautical command said in a written statement. The Airbus A330 crashed in the Atlantic Ocean June 1 en route from Rio de Janeiro, Brazil, to Paris, France, carrying 228 passengers and crew. Meanwhile, the French, who are leading the investigation, were increasing their naval efforts. The nuclear submarine Emeraude was expected to reach the search area Wednesday to search for wreckage, including the flight data recorder and cockpit voice recorder. And the French sent two tugs towing 40 tons of recovery equipment, a surveillance ship and a ship equipped for amphibious operations. Brazilian authorities said the plane debris will be taken to France for investigation but the bodies would undergo forensic tests in Recife. The cause of the crash is not known, but investigators are looking at the possible role of airspeed sensors known as Pitot tubes, among other factors. Air France has agreed to replace the sensors on its Airbus A330 and A340 jets, a pilots' union said Tuesday. The airline said Saturday that it began replacing its fleet's sensors last month. The biggest union, SNPL, said Tuesday it has accepted Air France's assurances that no Airbus A330 or A340 will take off unless at least two of its three Pitot tubes have been replaced. Union spokesman Eric Derivry added that there is no indication that the Pitot tubes caused the accident. Air France said over the weekend that it began to notice in May of last year that Pitot tubes sometimes briefly iced up at high altitude on A330s and A340s. That caused "a loss of airspeed data," according to the airline -- that is, the pilots didn't know the plane's speed. Air France decided to replace all its probes starting April 27, following laboratory tests earlier in the year, the airline said. That is the program the pilots say the airline has promised to complete within days. The ocean depth where the debris and bodies have been found varies, but averages about 3,000 meters (nearly 9,900 feet) deep, according to the University of New Hampshire/National Oceanic and Atmospheric Association Joint Hydrographic Center. The search area covers 200,000 square km (77,220 square miles), nearly the size of Romania, Brazilian officials said. Brazilian officials emphasized Monday that finding bodies was their main priority. The French are in charge of finding the voice and data recorders. Fourteen aircraft -- 12 Brazilian and two French -- were participating, along with five Brazilian ships and one French frigate. The U.S. Navy will contribute two high-tech acoustic devices to listen underwater for the emergency beacons that are attached to the voice and data recorders. The "towed pinger locators," which help search for emergency beacons on downed aircraft to a maximum depth of 20,000 feet -- will be placed aboard two French tugs that are part of the search efforts, the official said. CNN's Karl Penhaul, Ayesha Durgahee, Niki Cook, Jim Bittermann and Barbara Starr contributed to this report.